Officials in Virginia and across the country will be putting out messages of caution during National Work Zone Awareness Week. OAKTON, Va. — Standing inside a work zone on Stuart Mill Road, Paul Matticks with the Virginia Department of Transportation wants to send drivers a message: slow down. The second week of April is National Work Zone Awareness Week. Officials in Virginia and across the country will be illuminating electronic message signs with caution messages for passers-by. Virginia State Police plans to step up enforcement in several long-term work zones across the state. “A 36- or 48-inch-high plastic cone — I mean, that’s all we’ve got to stand behind, so we need them to see us,” Matticks said, talking over the roar of a Gradall excavator and idling dump trucks. More often than not, the district safety manager said, drivers ignore the orange advisory signs and approach work zones hastily. “Slow down, pay attention to the signs, pay attention to the flagger. For the couple of seconds that it’s going to interrupt your travel, you’re going to get by safe, and we’re going to be safe, and we’re all going to get home to see our families at the end of the day, which is ultimately our goal,” Matticks said. 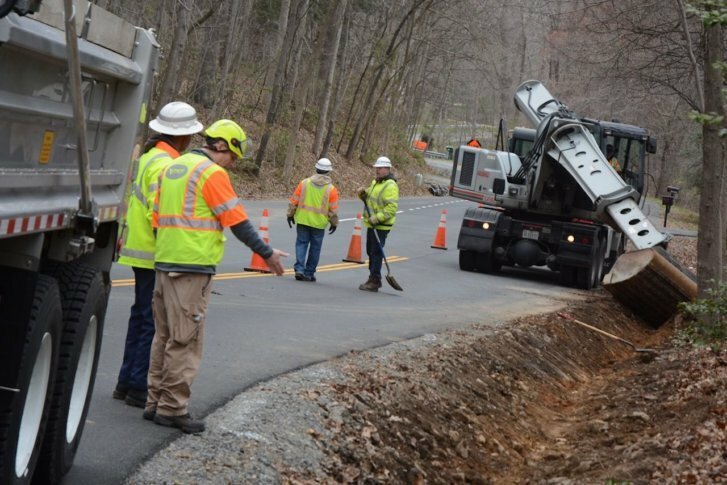 In Virginia, 12 deaths occurred in work zone crashes last year, a 20 percent increase over 2016. Of the 2,428 crashes in work zones across the state, 1,181 resulted in injury. Nearly 500 crashes occurred in work zones in Northern Virginia last year. “Even though we saw an overall decline in crashes in the NOVA district, any number higher than zero is too high for us. We don’t see these as just numbers, but lives affected,” said VDOT spokesperson Ellen Kamilakis. The district is posting photos of workers’ faces and families to social media all week to remind drivers of the daily dangers that highway crews face around the clock. “It’s work zone awareness week, but our work zones don’t end after this week. Our work zones are all year long. Take what you learn and see this week but pay attention and use it all year long, and it will make a big difference for everyone,” Matticks said.